Although I'm tempted to not do this, nevertheless, the Masters of Mustang exhibit left me largely disappointed due to the expansive gaps of model years missing from the Mustang's 50-years 'O history. Now did I expect every single model year to be on display? ABSOLUTELY NOT! And I have NO idea how hard its to pull off an exhibit in the first place, nor knowing if any cars have "left-the-building" since the beginning of the exhibit this past June, yet for Mwah, there were just too many 'Stang's missing! 1st Generation = 1964-73, 2ndGeneration = 1974-78, 3rd Generation = 1979-93, 4th Generation = 1994-2004, 5th Generation = 2005-2014, 6th Generation = 2015. Just cannot understand why one of the most significant Horses was completely lacking in presence at ACM, as surely everybody knows how important the BOSS was to the Mustang's history, not to mention being one of its most revered models, Along with being a large proponent towards keeping the philosophy of "Win on Sunday, Sell on Monday" alive 'N well for the Ford Motor Company! As the BOSS 302 was integral with the Pony Car's late 1960's success, when the Larry Shinoda designed 'Stang first appeared in 1969, with some 1,628 built. 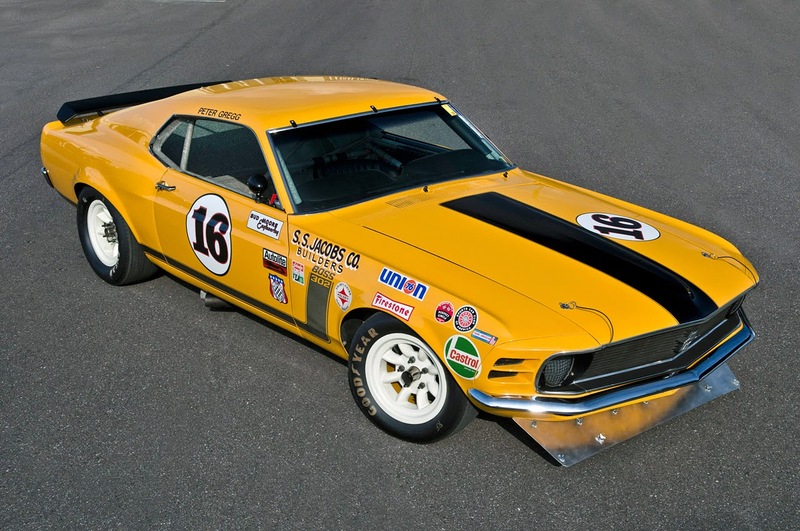 The BOSS 302, built for homologation in the then red hot SCCA Trans Am series was campaigned by Shelby American and Bud Moore, with Peter Revson, Horst Kwech and Dan Gurney piloting Shelby's cars. And Parnelli Jones and George Folmer at the keyboards of Moore's racers. Nonetheless Roger Penske's Camaro Z/28 driven by Mark Donohue won the championship trophy once again. Yet 1970's production run of 7,013 units were eagerly snapped up by the masses, while Parnelli Jones won the '70 Trans Am title in those NASTY "School Bus Yellow" Bud Moore 'stangs, as Shelby had withdrawn from Trans Am competition. But an even NASTIER version of the BOSS was produced, the Big Block version of the "Sports Roof" Mustang simply known as the 429, which today are considered as part of the Mustang's Holy Grail, where several have crossed the Barrett-Jackson auction block in the multi-hundred thousand's price-range over the past years! And while these two Bosses are the most popular, and probably most desired, due to their racing pedigree and outright horsepower. After their two-year production run, (1969-70) Ford produced the BOSS 351 for 1971 only as their replacement, to which it would have been nice to see one example of each on display. But at the very least, there should have been either a 1969 or '70 BOSS 302 on hand, or one of each, and even better yet, a 429 alongside them! Although I certainly didn't expect the 1964 1/2 Indianapolis 500 Pacecar to be on display, especially since only two were produced! Yet, surely one of the 10,000-plus 1979 Pacecar replica's could have been corralled! As none other than the 'Wee Scot, nee JYS, better known as Sir Jackie (Stewart) was that year's Indy 500 Pacecar driver. As although only 1,000 "ruby" red convertibles were produced, with the honours of chauffer duties appropriately falling to Parnelli Jones in May, 1994, it would have been really good to see one of the two latter Pacecar replicas on display; even better yet with the adjoining "NASCAR NATION" exhibit in the building. As reports denote, the '64's pacing of the Indianapolis 500 was most likely the nation's first exposure to the "Pony Car!" Naturally, the Karmic whip snapped Mwah firmly upside the head upon my return home, when researching info for this story, unbeknownst to me was the just recent announcement of the lone '64 1/2 Pacecar having gone on sale for a cool million-plus dollars; YIKES! While I understand the possible pressure to ignore this segment in detriment to Ford's versions of the iconic Mustang instead, unfortunately this exercise seems somewhat skewed by the presence of Carroll Shelby "Breathed On" Mustang chassis on hand, most notably the GT-350 Drag Car, Convertible and Hertz "Rent-a-Car" models on display, as Steve Saleen has long since been considered the modern day Shelby and thus, it was disappointing to not see at least one single example of Saleen's past work in regards to his excellent tuning capabilities. 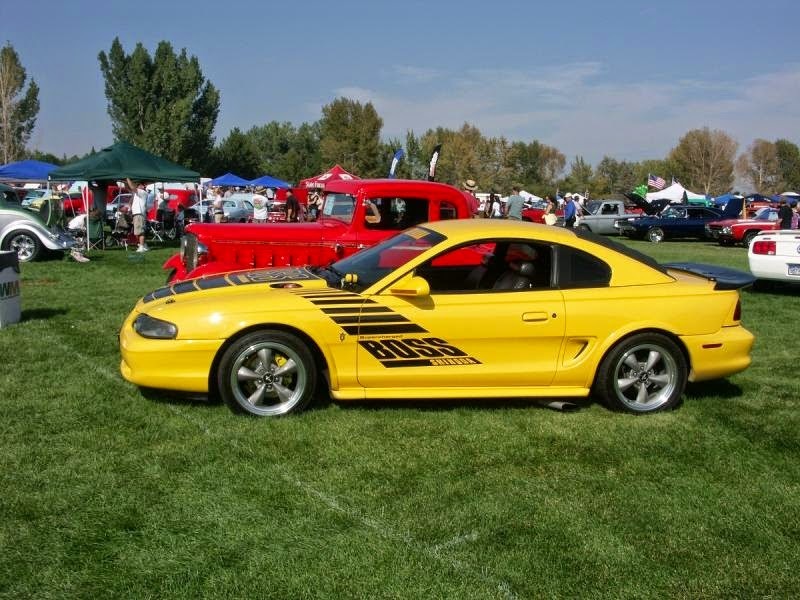 especially since Saleen has garnered Ford and its Mustang so much winning zeal upon the racetracks across the world. As Saleen's have won races and championships in SCCA competition, not to mention returning Mustang to le Circuit de la Sarthe after a 30yr drought with those awesome looking Saleen-Allen RRR GT 'Stangs! Thus, surely, at least one version of a past or present Saleen could have made its way into America's Car Museum, right? Having been the proud owner of a 1969 Mach 1, albeit in dire need of restoration, to which its funny now that I cannot even recall how long I owned I-T? Naturally I was majorly BUMMED over the lack of NO 1969-70 Mach 1's on display, or the lack of a '69 coupe or convertible, with their unique four round large headlights easily distinguishing what year they are. So I did the next best thingy and bought a weathered '69 Mach 1 instead, which I opted for a 4-Speed car naturally. For which I cannot count the endless hours of satisfaction my "Arrest Me Red" BEATER Mustang afforded me during my weekly "Sunday Drives!" Or how many hours I spent by the fire fantasizing over various restoration avenues I'd pursue one day in the future. Only in the Wild, Wild, West!" As surely either a 1969 or 1970 Mach 1, or better yet, one each, with a '69 "Non Ram Air" and '70 "Shaker" hood car could have been present at ACM, since I'm pretty sure over 100,000 examples of just the Sports Roof version alone were produced!